With the memory of last year’s nasty flu season still fresh in people’s minds, more Americans plan to get vaccinated this year, and both Walgreens and Kmart hope it happens in their stores. A recent survey, conducted by Harris Polls for CityMD, reports that 57% of American adults intend to get a seasonal influenza shot, up from 51% two years ago. While the biggest shifts are for those 65 and older, the 18- to 34-year-olds are also rolling up their sleeves, with 54% saying they intend to get vaccinated, up from 42% in 2016. Last season’s flu ranked in the “high severity” category, reports the U.S. Centers for Disease Control, making it just one of three seasons to earn that distinction since 2003. Kmart is more or less paying people to get vaccinated, offering $5 in cashback points for pharmacy reward members. And Walgreens is running a marketing campaign, including TV spots airing throughout the season. Ads emphasize that vaccines are a way to protect those around you. 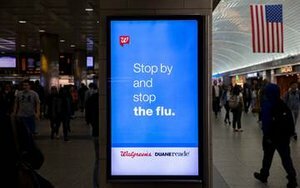 Walgreens has also been running takeovers in some of the country’s germiest places, including New York’s Grand Central Station and Penn Station, and Chicago’s Blue and Red Lines. Ads are also running in taxicabs and on radio. The campaign comes as Walgreens continues its efforts to rejuvenate retail performance. Walgreens Boots Alliance, the parent company, just reported that fourth-quarter sales reached $33.4 billion, an increase of 11% from the year-ago quarter. And net earnings jumped 89% to $1.5 billion. The company says its integration of Rite Aid stores is on track, that it’s gaining pharmacy market share, and that it continues to make progress on its partnership strategy, including recent deals with Kroger, Alibaba and LabCorp. Those gains, however, mask ongoing weakness in Walgreens' non-pharmacy business. Comparable-store sales rose by just 0.3%; while front-of-store sales, which exclude pharmacy, fell 2% in the quarter, led by declines in consumables, general merchandise and personal care. It says sales improved in health and wellness category and beauty.